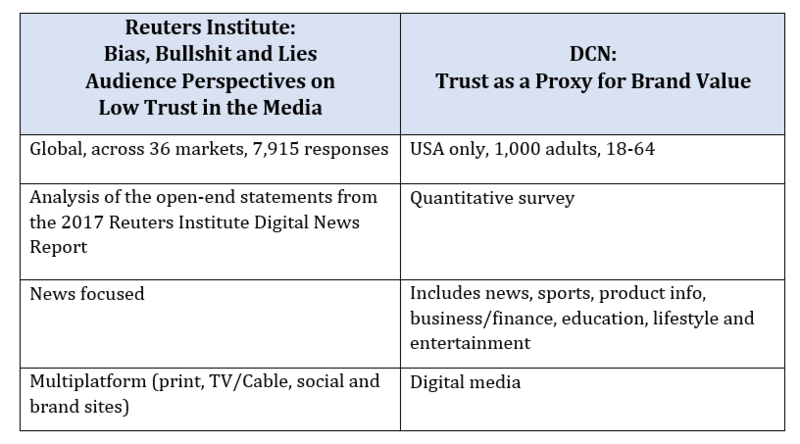 Digital Content Next (DCN) and the Reuters Institute both released significant studies on trust in digital information within a week of each other. Here’s a topline analysis of the many consistencies in the findings important to navigating the future of digital content and building trust in media. Social media is trusted less than the news media in its ability to separate fact from fiction. Respondents think newsfeeds are filled with inaccurate information, extreme agendas, and strong opinions, perhaps encouraged by social media algorithms. A significant proportion of respondents feel journalists do a good job in checking sources, verifying facts, and providing evidence to back up claims. Supports DCN’s findings regarding the building blocks of the Trust Model and the importance of key components: brand sites must focus on four key areas to build trust: attribution (confirming multiple sources), reputation or authority, navigation/user experience, and prediction — building a direct relationship with consumers that builds upon past experiences. In talking about trust, people mention television brands more than any other type of media (e.g. print or online). Supports DCN’s findings in the regarding top trust brands – Newspaper and TV/Cable legacy brands historically rooted in media. Some media outlets are taking sides, encouraging polarized set of opinions. Supports DCN’s recommendation that Brand sites and apps should focus on what’s vital to consumers to drive trust, position their content as regularly updated, respected, and authentic in addition to the core positioning of high quality and trustworthy. A substantial minority who trust social media, do so for its broad range of views and authenticity. DCN’s recommendation that fake news and distracting settings are significant problems in the digital landscape. A good opportunity for premium publishers to market themselves as a destination to avoid these annoyances. The media need to do a better job in separating facts from opinion. Correlates to DCN’s discussion of vital drivers of trust. Premium content should be in-depth, respected, expert and authentic. These are the definitions of trust that move the needle. Build a more representative media – in terms of age, politics, economic outlook, and gender – is likely to help answer the criticism that media is only looking after the interests of the establishment (we don’t speak to diversification of reporting). Building trust takes a strong commitment from publishers and platforms, alike, to develop a successful consumer relationship. It requires understanding and strategically implementing components and drivers of trust. Importantly, the need for self-monitoring is essential to ensure accurate and credible reporting is commonly practiced.